I’ve been struggling for a few weeks to come up with words. This is not a typical problem for me, as my friends and family can well attest. But here I am, trying for the third week in a row to gracefully express the fact that I’m leaving Bluestone Farm, and that I am sad and excited and grateful and nostalgic, all at once. I’ve been combing through poems and song lyrics, pondering the precise image, aiming to find the most eloquent, most perfect thing to capture the happy melancholy that I’m feeling, but it looks like I’m going to have to just speak for myself. So here I am, making a change again. I’ve been invited to participate in the work of a small farm and learning center in western Massachusetts, called Open View Farm Educational Center. The farm is dedicated to fostering inclusivity, peace and justice, and creativity, and it has a special focus on GLBTQ issues. With a flock of sheep, a llama named Lily, and pastured hens, the farm creates opportunities for people to enter into a deeper relationship with nature, to slow down, and to interact with some of our fellow creatures. My role will be to design and create teaching gardens, to help build farm infrastructure including a pole barn and an earthen oven, to be an woodshop apprentice to the farm's owner, Emmy, and to help out with the household, including Emmy's two teenage daughters and a young-adult friend of the family. I’m thrilled about these new learning opportunities, which will challenge me to build on the experience I've gained at Bluestone Farm. To top it all off, one of my best friends from high school, Leslie, lives with her family just a quarter mile down the road. I’ve long loved western Mass, ever since I lived there after college. It’s where my partner Anne and I met and started dating, way back in 1994. Returning there feels in many ways like a kind of homecoming, though, ironically, Anne will still be in New York, where her job is located. Being apart during the week will be difficult, but we’ve lived semi-apart before, and we know that not only will we make the most of our time together, but we’ll also learn and grow as individuals in our time apart. But I am also sad to leave this life at Bluestone Farm. The community here has supported me through an amazing period of transition, from leaving academia to embracing my full range of passions: food, farming, spirituality, building, Earth, and writing. I’ve had the space here to deeply engage with my struggles with religion, to wrestle down those desires and discomforts, and to see what lies underneath. And I’ve discerned that, in the end, at least for now, organized religion still is not home to me. I had hoped that my time here would prove otherwise, would allow me to dive with abandon into tradition, community, and ritual. Although the Sisters weave the new cosmology, with all its wonder and appreciation of the universe into their theology, and although I can now interpret more traditional liturgy in the framework of unitive consciousness, and although the Sisters have, with great love and compassion, invited me wholeheartedly to share in their worship, I somehow still find myself on the outside. In the end, it’s time to go. And with what a debt of gratitude! I have learned so much in the two years since I first visited the farm in mid-March, 2009. I was in crisis, needing to be connected to nature, needing a new vocational direction, and Anne said, “Why don’t we visit these nuns I know, on this farm nearby, to get you out of the city for a day.” It was just after St. Patrick’s Day, and we ate Reuben pizzas, with leftover corned beef, homemade sauerkraut, and Russian dressing on rye-dough pizza crust. And we stayed the night. On the train home, we marveled that we laughed like we hadn’t laughed in a long, long time. After that visit, I returned nearly every weekend, my center of gravity shifting from the cubicle and the treadmill in all that concrete to the soil and the sky. The farm, and the community here, created a space for me to dig deep into myself, to learn to listen again to my own inner wisdom, to reconnect. And then there’s all that other stuff I learned! How to sow seeds, transplant seedlings, harvest and preserve food, make yogurt and cheese, collect maple sap, make compost tea, cook with whatever’s on hand. And all the subjects and practices to which I’ve been introduced--the new cosmology, permaculture and edible forest gardening, peak oil, transition towns, the gnostic gospels, nutrient dense farming, silent retreats, natural building, humanure, tenebrae, plainchant, meditation. It’s been more than an education, it’s been a whole new perspective on being human. I will miss this place, and these people, more than I can even anticipate. 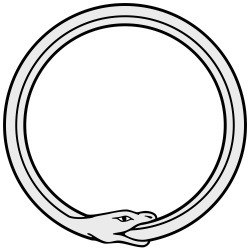 So here I am, like Ouroboros, a snake eating my own tail, cycling back again. Jung wrote that Ourobouros slays itself and then gives birth to itself again, and in some ways, that’s what this feels like. Time to die, time to be born. I am so grateful for all the midwives in my life . . .